Tess swings her hips a bit when she walks. I think it's the stilted gait, though, that causes it Very cute. Topic: Ginger is growing so big! coleywoley wrote: She weighs 136.8 pounds. really, really hoping that 1 was a typo.....If not, you have a mutant Chow! 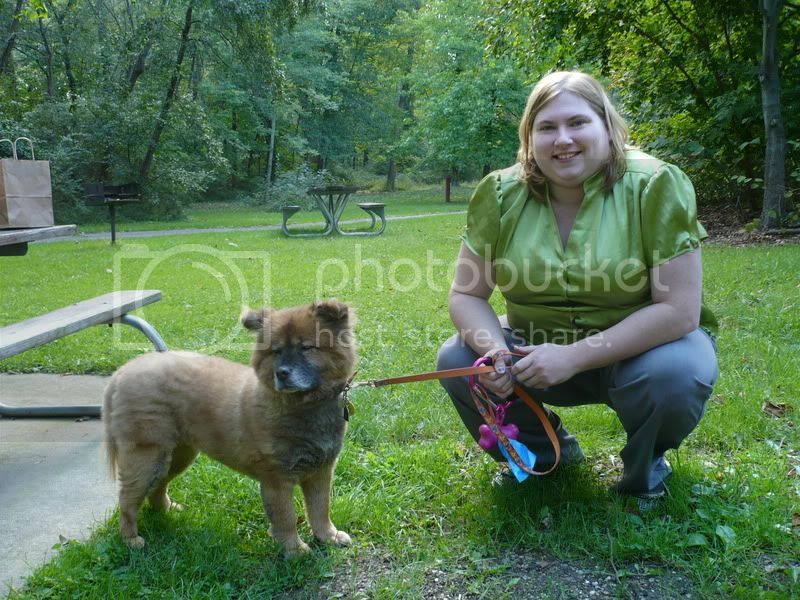 Topic: Lakota: Nashville, TN - Female Chow no longer in need! I am dreaming of a scenario in which the landlord says, "I love dogs! Go ahead and adopt her!" and the money for food and vet bills just pours in. I'd love to adopt Lakota but as the above scenario is very much a dream, I don't think it'll be happening right now. :( Hope she finds a forever home soon! Awwww, how much does she weigh now? They grow soooo fast! Hey! Send some of that snow down to West Virginia. Been in the 50s all week here. Yes, you saw that right, I'm a West Virginian now! Definitely missing the Snow Belt and northeastern Ohio. Deb, that is too funny about Terra and the dog toys. Sounds like something Tess would do, actually. Titus, you did such a good job decorating that tree! You are all ready for Santa. Titus is gorgeous and so are your decorations. Topic: To crate in car or not????? Topic: Why did you choose a chow? Topic: What's your chows favourite people food? Tess's is definitely cheese. Most kinds, but she really likes that fake American cheese stuff. Zoe looooooved beer. She'd go nuts just hearing the can be cracked open. Amanda will have to tell you what Fiona's is. I'm usually doing good to get her to take a training treat from me. What a beautiful pair! Lacey is going to be a big Chowgirl, I think. Looks like they had fun in the snow! Nah, the Chows really aren't into the trash. It's the Collie you gotta watch there. She has been known to treat herself to a feast in the kitchen garbage can. I get to see my doggies today! Yay!!! Such beautiful girls! thanks for the pictures. I never posted to this thread. So, here is a picture of me with Fiona on the day of her adoption (September 16th). My hair is horrible (it's since been cut).